We now have a version of cgminer 3.7.2 available for mining Scrypt (LTC) only on the 5-chip Gridseed GC3355 ASIC devices with properly displayed local hashrate as well as HW error rate and the full cgminer 3.7.2 functionality (thanks to a user called dtbartle on GitHub). We have compiled a windows version of that miner that you can download and install it to finally have fully functional cgminer on your Gridseed Scrypt ASIC (source code available here). Have in mind that you need to install a WinUSB driver on top of the standard installed USB to COM driver for the miner in order for cgminer to detect and run on your ASIC in LTC only mode with low power consumption of about 8W. Do note that if running single Gridseed ASIC device you can have it connected to the system and use the hotplug 0 option, if you have more than a single miner you may have to set commandline option hotplug to 5 or 10 and then run cgminer and start plugging the USB cables of the miners (USB hubs with power on/off buttons work great for that). hello , thanks for your article ! I have a problem : In Zadig , i have’nt CP2102 USB but only “ST32 Virtual COM Port” have you a idea ? Do I need Zadig to run cgminer 3.7.2 for GRIDSEED 3355 5 chip miners even though I already have STMelectronics Virtual Comm Port drivers installed and have been using successfully with cpuminer. If your unit has a STM32 Virtual COM Port (or something else) instead of CP2102 USB to UART Bridge Controller you can try replacing that driver by following the same procedure, it might also work, though unfortunately we do not have a unit with the newer chip to test ourselves. If it does not work, just uninstall the driver and the device should install back the original driver and work again with the cpuminer. guyver, no idea what the problem could be t the moment, unfortunately we have only one Gridseed ASIC device, so we cannot currently test with more than one… so far no issues with one miner though, running for more than 12 hours already. I know it picks up two devices, but when you plug the third one in, I get the following error. Tried updating the driver STM32 Virtual COM Port. With the Zadig driver. Still a no go. Cgminer reports no device found. Already reverted back to the other Cgminer. Also if you update the driver and run into a problem.Go into hardware and remove – reinstall the STM32 Virtual COM Port driver. Where does one download this “standard installed USB to COM driver”? Or is it already built into Windows? And is Zadig the “WinUSB driver”? Rowan, the virtual COM to USB driver depends on the chip used in the device, there are apparently variations in what is being used – you should get it with the miner or a link to the driver passed to you based on the version of the miner you have. Zadig only replaces the driver with the WinUSB driver, this one you already have on Windows, no need to install it. This should recognize all that are connected to that hub. 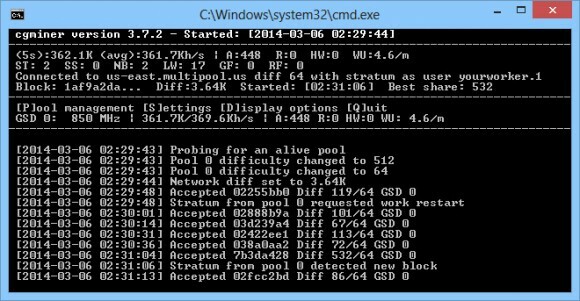 You may also have to change the –hotplug 1 to –hotplug 5 in the CGMiner batch file/command line. Still can’t get 20 grid seeds to work. Has anyone got 20 working? If so what did you do? I’ve got it working, but I seem to be limited to 39 devices no matter how I configure the hubs. Any ideas? Also, after device 16 the gui for cgminer hangs, but it’s still going. Cgwatcher confirms. Thanks Bob, as I saw the GUI hanging when I tried 20 so assumed it was not working. I did not check if I was getting the correct speed. I will try again and use CGWatcher to monitor it. My gridseed arrived today and there is no software or link with it. How do I get it up and running? Thanks. Thanks for your guide! I figured out a solution to the USB plug/unplug issue and miners disappearing. It’s not great, but it gets the job done. Rowan, read my comment a couple posts up. It would have solved your problem. i use the bfgminer can’t found any GRIDSEED. The procedure for using bfgminer is not the same as the one described above for cgminer, you don’t need to use the WinUSB driver with bfgminer like you need with cgminer! The OCL devices are the video cards, we have configured the bfgminer to only detect and activate mining on the Gridseed ASICs by default. Hello, Just a quick question. I was using the ZADIG software and I accidentally installed the USB driver over my Logitech wireless mouse and keyboard , do you know how I can re install the original driver back to that USB interface? TC, just uninstall the modified driver for the mouse and keyboard from the Windows Device Manager and scan for hardware changes. If it installs the modified driver again just select to update it and choose to update the driver right clicking on it and then select to manually choose and pick from the list of drivers on your computer. You should see the original driver listed there. Any workaround for the need to plug in the gridseeds only after cgminer is running? Quick question on cgminer for gridseed, do the failover or balance commands work for gridseed? I want to have 2-3 pools for failover or balance distribution. As a pc an uses more than 2KW per day using the gridseed on anything other than a raspberry pi using the hashra controla software seems like banging your head into a wall when the door is just next to you. I have an issue, on Windows 8 x64 after running CGminer and using the Zadig CP2102 driver replacement method as outlined. After a few hours (it varies between 1 and 9 hours) it stops sending shares. I can unplug the USB and plug it back in and it’ll start sending shared. I’ve unplugged and plugged in the Gridseed in and re-installed the drivers and let it and i does the same thing hours later. Ideas? I have 43 units and 5 usb hubs, whats the easiest way to connect them and only use a single controller if possible? 43 gridseeds, 8 power supplies, 5, 10 port usb hubs. to be exact. They were supposed to come with a controller for all 43 but it wasnt in the package with the rest of the equipment. So I have 43 units just chillin doing nothing. How would I get them to work as one unit witha single controller or pc? or am I going to have to pick up 4 to 5 controllers and build it as 4 10 unit rigs? You would probably have to use a PC as so many miners will most likely be too much for a single Raspberry Pi, though with two or three RPi used as controllers it might also work out well. So I need a cheap pc with enough USB ports to handle all the hubs and keyboard etc? I wont get any errors or anything? The pc will pick up all 43 devices no problem? Or can i get a separate hub and plug all the other hubs that hold the gridseeds into it? Just need to know the cheapest and or easiest route to take, i can get a PC with 8 USB outlets and WIN 7 for 150 bucks, so thats cheaper then getting 3 to 4 PI’s, I read that win 7 can read more than 10 com ports with no hiccups. I’m a dumb dumb to all this so easy is good. Dave R, you can just get a smaller USB hub that you connect the bigger hubs into and have that one connected to the PC. It could help to have a USB hub with a on/off button to make it easier. Then first you run the cgminer and then turn on the USB Hub or connect t to the PC (make sure the hotplug command line option is set to 5) and cgminer should detect and show all miners. If you are still having trouble you might want to also try bfgminer, though for it to work you will need to revert back to the standard USB to COM drivers first. Your problem is going to be, that cgminer will only run 15 gridseeds at once..try adding any more and it will lock up!.. Solution: You can run several cgminers side by side on one computer by changing the name of each folder, then fire up one at a time. I used a different miner for each one. They will work fine with each other & it just takes a but of testing to get them even with your miners, otherwise one will take up the whole 15 and leave the rest for the next screen. I have been running this with 20 miners. I’m trying to duplicate what you’ve explained above, but I’m having trouble. Indeed, over 15 gridseeds freezes CGminer. Can you explain in more detail how you achieved 20 gridseeds (which is also how many I have). I follow your logic behind it, but I have to plug my miners in once CGminer is running, and when ever I plug them in, the already open CGminer tries to add the miners to it, and it freezes. Gridseed: Solo is not mining! cgminer write: Network diff set to 0.
bat file of this? com port? Downloaded what you said here and it IMMEDIATELY detected the Gridseed after messing with it for all day. hello whay my gcminer and gridseed run at 600 mhz?